The RFTA bus that crashed near El Jebel in October 2013, ejecting six passengers on to Highway 82. RFTA settled claims with all plaintiffs in the case Tuesday. 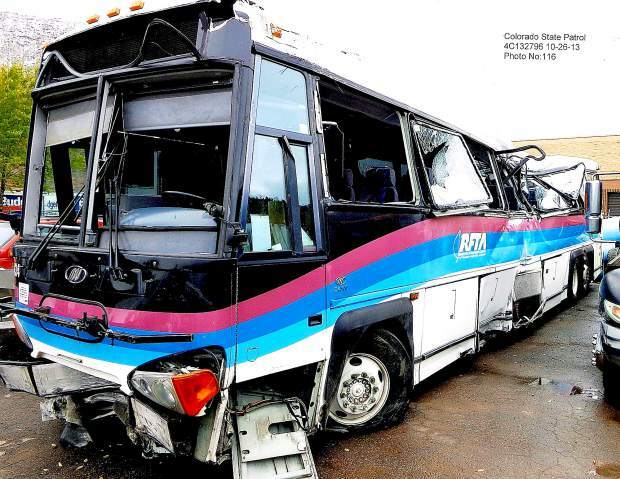 After nearly a year of negotiations, the Roaring Fork Transportation Authority and two other defendants settled all plaintiffs’ claims Tuesday in a 2013 bus crash that ejected six passengers onto Highway 82. The settlements, filed in Pitkin County District Court on Tuesday afternoon, came about two weeks before a second trial in the case was to begin. That trial now has been canceled. The first trial a year ago determined each of the three defendants’ percentage of responsibility in the crash, while the second would have determined monetary damages due to each plaintiff. “I’m happy for my clients that it’s over,” said Aspen attorney Alan Feldman, who represented four of the 10 plaintiffs in the case. “I think the case should have settled a long time ago. Gordon Vaughan, a Colorado Springs lawyer who litigated the case under a contract with RFTA, took umbrage to that characterization. RFTA could not begin to obtain information from plaintiffs about medical and other claims until the first trial ended just before Christmas last year, he said. After that, RFTA and Vaughan worked diligently to figure out and negotiate each claim, which takes time, Vaughan said. Messages left Wednesday for RFTA General Manager Dan Blankenship and RFTA attorney Paul Taddune were not returned. The crash occurred after dark in October 2013 on Highway 82 near El Jebel after the bus driver swerved to avoid a slow-moving tractor in the right lane. The driver, Jaime Nunez, missed the tractor and ended up in the median between lanes, then over-corrected trying to get the bus back on the road and hit a concrete barrier. Nunez testified that he didn’t see the tractor until the last second. Six of the 11 passengers on board were ejected in the crash, including one woman who ended up under the bus. The tractor was towing a mower, which at least partially obscured the tractor’s rear lights, and did not have a reflective emblem on the back identifying it as a slow-moving vehicle, according to testimony at the trial. Two other drivers testified they nearly hit the tractor as well just before the bus crash. While the District Attorney’s Office declined to pursue criminal charges against Nunez, nine passengers and the spouse of one of the passengers filed a lawsuit against Nunez, the tractor driver, Travis Wingfield, and the tractor owner, Ted Potter. A Pitkin County jury of four women and two men determined a year ago that Nunez and RFTA, which were considered one defendant, were 50 percent responsible for the crash, while Wingfield bore 45 percent responsibility and Potter was liable for 5 percent. The Colorado Governmental Immunity Act capped RFTA’s total monetary liability in the case at $990,000, according to lawyers and court documents. Each individual’s monetary damages were limited to a maximum of $350,000. Most of the settlements in the case are confidential, according to Vaughan and Feldman. However, four plaintiffs received settlements from RFTA’s insurance company without confidentiality agreements, according to a motion filed by Vaughan last week. One of those plaintiffs received a $5,001 settlement, two got $10,000 each and one received $21,000, according to the motion. While the remaining settlements included confidentiality agreements, Vaughan said Wednesday he thinks the RFTA settlements would likely be available in the next couple of weeks through an open records request because they involve a governmental entity. One issue remains to be decided in the case, which may end up costing RFTA more money. RFTA sued Wingfield and Potter for damages during the trial in what is known as a “cross claim.” The transit agency lost that claim when the jury found it was the most responsible for the crash, which means it may be on the hook for some of Wingfield and Potter’s legal costs. Wingfield racked up more than $180,000 in legal costs during the case, while Potter incurred more than $72,000 in legal costs, according to motions filed in the case. District Judge John Neiley will determine the outcome of that issue during a hearing to be held in the near future, Vaughan said.